More fun than a 40-mile hike with full pack, Chez Grunt lets you hunt for slack, better food, choice assignments . . . and even Nookie . . . in the barracks! 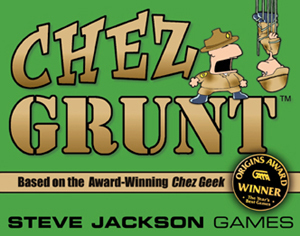 Chez Grunt is completely compatible, of course, with its famous predecessor, Chez Geek. You're In The Army Now -- might as well get all the slack you can! Note : This game CAN be played by itself, and/or with Chez Grunt, Chez Greek, Chez Geek, and it's expansions for some wicked fun!! !